The data that the Bureau of Labor Statistics released on Thursday gives me a chance to explain why I disagree. In short, the relative performance of more educated and less educated workers over the last few years has not been the typical pattern for a recession. Less educated workers, by many measures, are faring worse than they ever have. The ratio of the typical four-year college graduate’s pay to a typical high-school graduate’s pay hit a record in 2010 — 1.56. 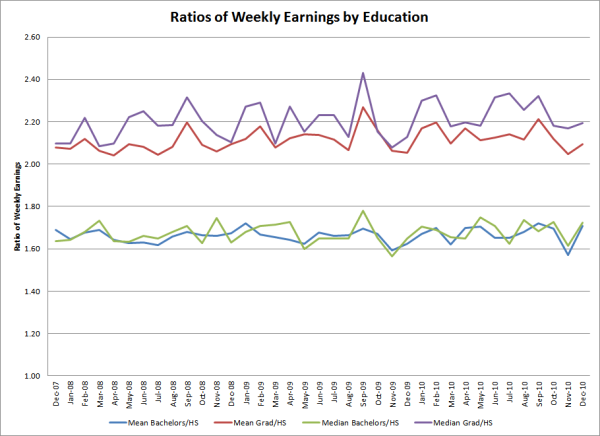 Since 2007, the inflation-adjusted median weekly pay of college graduates has risen 1.6 percent. The inflation-adjusted pay of every other educational group — high school dropouts, high school graduates and people who attended college but did not get a four-year degree — has fallen since 2007. The same is true over the last decade; amazingly, only college graduates have received a raise. This got me thinking about whether there might be some interaction between the age and the educational attainment of the workforce. As older workers move out of the labor force the educational composition of the workforce changes, given the increase in higher education since World War II. So I started looking at the monthly CPS data since the Great Recession began (December 2007) to see what, if any, impact this might have had. 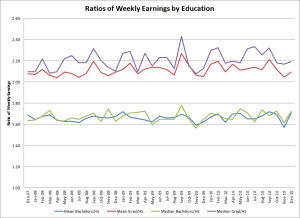 First of all, let’s look at the relative changes in weekly earnings. 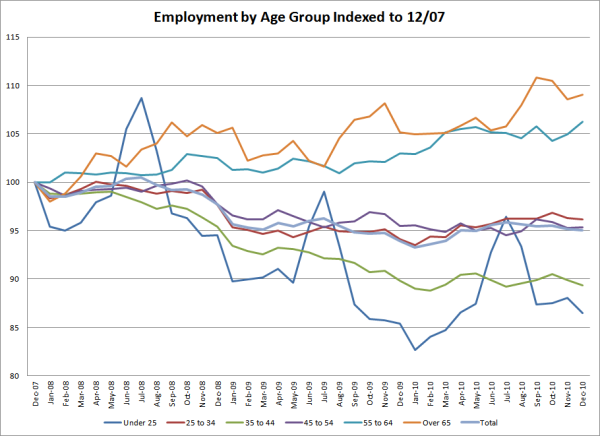 This graph shows the number of employed indexed to December 2007. These numbers are not seasonally adjusted, which is especially obvious in the under-25 age group. The shocker here is what’s going on among older workers. 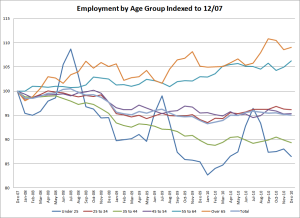 Those 55 and older increased their employment by 5 to 10 percent. This reflects a 6% increase in labor force participation for those 65 and older and no change for those 54 to 65. Those workers from 25 to 54 years old decreased their labor force participation rates by 1.5%, while those under 25 decreased theirs by 28%. 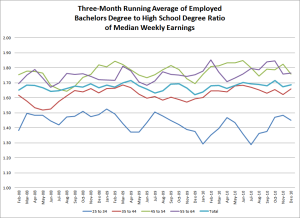 Here I have produced a three month running average of the ratio of real median weekly earnings for bachelors degree recipients to high school diploma holders (the monthly data is fairly noisy). There is a slight downward trend for the 25 to 34 cohort that offsets the smaller upward trend in the older cohorts. So what we see happening is experience winning out over education during the current economic crisis. But even this simple story doesn’t quite fit. In the final figure (I promise! 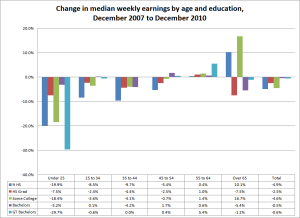 ), I present the percentage change in real median weekly earnings between the beginning of the recession and the latest month available (I’m again using three-month averages, so Dec. ’07 – Feb. ’08 and Oct. ’10 to Dec. ’10). 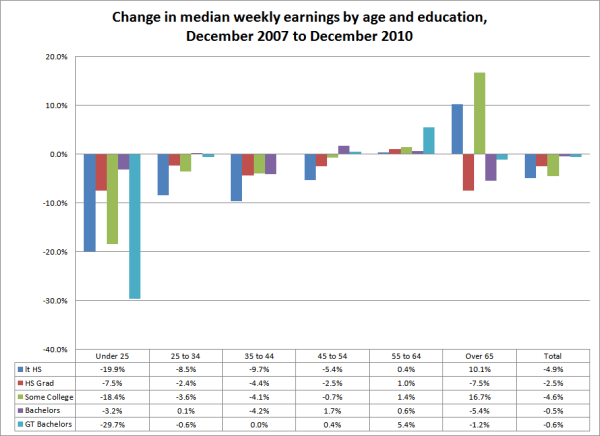 The youngest workers are faring the worst, but there is no trend according to education. High school and four-year college grads are doing the best, while those with graduate degrees are faring the worst among those under 25 (although this last group is very small, so this shift might just be sampling error). Among those workers aged 55 to 64, every educational attainment category is doing better, especially those with graduate degrees. Among the 65 and older workers, those with less than a high school degree and those with some college are doing much better now than at the beginning of the Great Recession, while those with graduate degrees are doing slightly worse and those with high school degrees are doing just as bad, relatively, as the under-25 crowd. And overall, no cohort is doing as well as it was at the beginning of the Great Recession. So, there is no simple tale to tell here about the relationship between education and shifts in inequality. Yes, those with less education have fared worse than those with more. 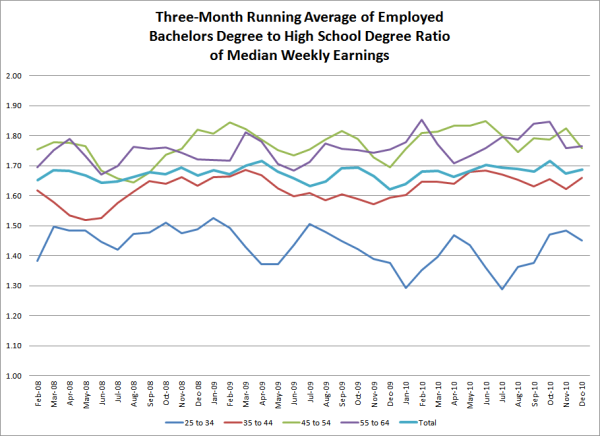 But high school graduates appear to do better (less worse, really) than those with some college less than a bachelors degree. And for the oldest workers, the opposite appears to be true.